There has been a lot of talk about how to get women into tech, particularly on company boards and into leadership positions. 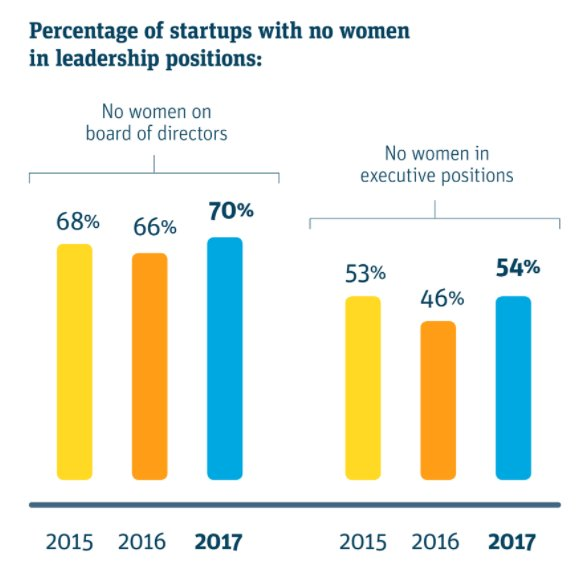 Yet despite the scrutiny, the number of boards with no women increased in 2017, according to Silicon Valley Bank's 2017 "Startup Outlook" report . More than 70% of the 941 startups surveyed did not have a single female board member in 2017, up from 66% the year before. And it's not just board seats. The number of companies with no women in executive positions also increased in 2017, to more than half of the companies surveyed. It's a worrying uptick to a trend that has received a lot of lip service but little action. When First Round Capital conducted a similar survey six months ago , nearly a third of the 700 startups it surveyed hadn't even talked about diversity as a company priority. According to Silicon Valley Bank, at least a quarter of the companies that responded did have some diversity plans. But that doesn't mean companies will be able to reverse this trend. Even Facebook, with its best-laid plans, has struggled with promoting diversity and inclusion in its ranks.